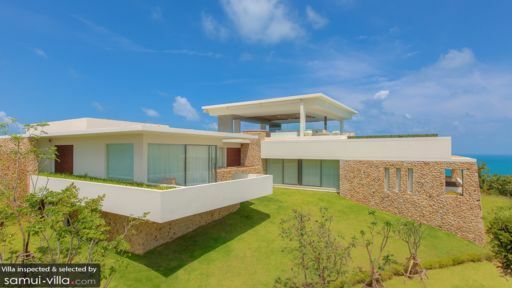 Hugging close to the coastline of Choeng Mon, Villa Saam Sip sits within the exclusive villa estate of Samujana. Step into the estate compound, and you will find a fine selection of modern and stylish vacation abodes in a peaceful environment. 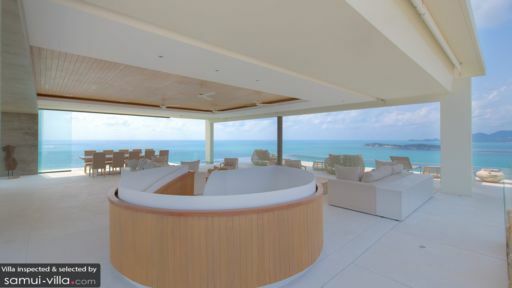 The villas overlook the sweeping bay, offering guests with spectacular vistas of the sparkling sea. At the end of a fun-filled day, guests will gladly retire to one of the five en-suite bedrooms in the villa. Ideal for rest and relaxation, the bedrooms contain plush and pillowy beds, and are bedecked in soothing, neutral hues. A tasteful selection of Asian art works brighten up the rooms and lend an oriental touch to the contemporary interiors. A private balcony extends out from each bedroom, offering an intimate spot for couples to cosy up while enjoying the sweeping sea views. The jewel in the crown of Samujana estate, Villa Saam Sip perches atop the highest point within the villa complex and commands panoramic views of its surroundings. Built to impress, the commodious grounds of the villa is home to a sparkling infinity pool, an expansive pool deck and a lovely tropical garden. Villa Saam Sip is the perfect spot for throwing an eventful bash or an intimate dinner party. The sleek and spacious interiors are perfect for accommodating large groups, and a plethora of amenities, such as a private gym and home cinema will keep your guests entertained. Settle down into the cosy couches of the living area, or gather round the dining area for a delectable feast. At either spots, you and your guests will enjoy beautiful views of Choeng Mon’s scenic coastlines. Your stay at Villa Saam Sip includes housekeeping services, security services, personal guest services, welcome drinks, airport transfers and a daily breakfast service. Amenities available at additional cost include laundry service, in-villa massages, personal driver services, vehicle rental, bicycle rental, boat rental and personal chef services. Villa Saam Sip offers kid-friendly amenities. A baby cot and pool fence may be used at no extra charges, while professional child minding services are available at additional cost. 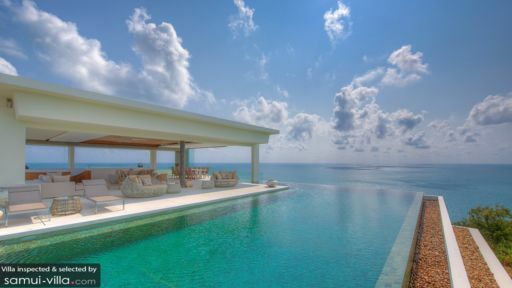 Villa Saam Sip is the perfect vacation rental for the active and adventurous. Holidaymakers with a love for getting wet and wild may embark on a water ski, diving or snorkeling trip. Nature lovers and cultural buffs will enjoy venturing out to explore tumbling waterfalls, ancient temples and lush nature parks. Sailing and yachting enthusiasts can take their pick from a fleet of sailing boats or motorboats, and spend a day out in the sun cruising through the turquoise waters. At the end of a fun-filled day, spoil yourself with a soothing massage in the compounds of your villa.